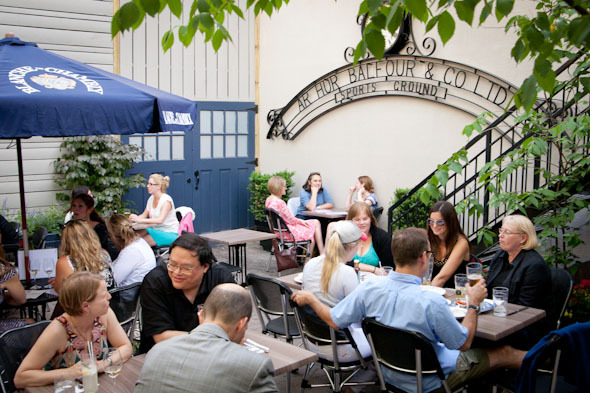 The Oxley — patio and proper — is one of Toronto's newest pubs. The duo behind The Queen and Beaver just opened this offshoot British pub, offering their take on sticky toffee pudding and fish pie and peas to the refined palates of the Yorkville community. And like every good public house, The Oxley offers ample outdoor cider-sucking space with a patio out front facing Hazelton Hotel, and another out back for a more "intimate experience." So if you're looking for a place to get legless (or, you know, just enjoy the sunshine), here are the details on The Oxley's patios. The back patio has about twice the space as the front and is adorned with hanging plants and lights, an herb garden, and a high-fence perimeter. This is the spot for seclusion-seekers who like a little ambiance with their Fuller's London Pride. I, on the other hand, am partial to The Oxley's front patio, which offers a prime spot for people-watching, a favourite pastime of all those who frequent the Yorkville area. Where to begin? If classics are what you're after, you can't go wrong with a good old plate of fish n' chips or a dry aged burger — chef Andrew Carter's specialty. Though I suspect The Oxley's patios will soon draw hoards of regular brunch-growers who are keen on the full English breakfast experience. For quick snacks and sharables, The Oxley also offers bar picks such as chips and ketchup, scotch eggs, and Welsh rabbit. A mix of England, Scotland, and Ontario, with cask conditioned ales on regular rotation. If you're looking for a cheap imperial pint (you should probably venture out of Yorkville..?) The Oxley goes as low as $7.00 for Steam Whistle draught, right up to $8.95 for a glass of Innis & Gunn Scotch Barrel Aged, the priciest draught on its list. The drink menu also offers a couple of Ontario ciders, bottles of beer from the provinces and UK, and plenty of options of pudding and regular wine. The pub's specialty, according to The Oxley's Spencer Brown, is its Hendrick's Smash, made with Hendricks and fresh lemon and basil ($11.00). While still new, Brown expects the Sunday feasting menu will be a huge patio hit — especially with a crowd expecting wood roast suckling pig. And with a blackberry mojito or classic mint julep in hand (both $13), I suspect we might actually see Yorkville a little more jovial. Both patios are currently first-come-first-served, though The Oxley might consider taking reservations for the back space. Maybe. No pitchers either as of yet, but Brown says they may consider offering bowls of an English version of a claret cup. Both patios are uncovered (though there are a few umbrellas in the back), so bring along those wide brimmed hats. Weekday patio hours: 11:30 a.m. to 2 a.m. 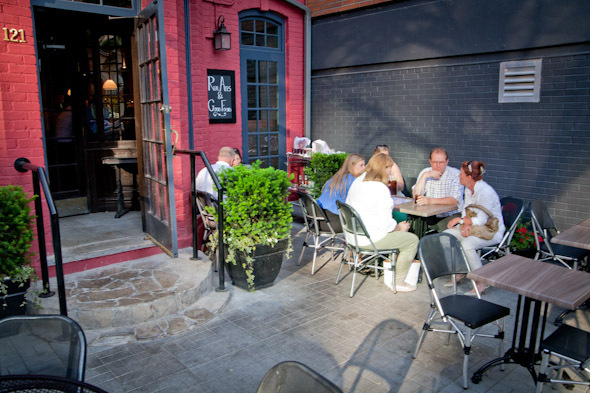 Weekend patio hours: 10:30 a.m. to 2 a.m. Kitchen closes at: 11 p.m.
A big thanks to Shock Top for sponsoring our patio adventures.